Goodbye to Lola’s and hello to Ysabel, a new restaurant in the former martini bar’s digs, revamped by the Laurel Hardware folks with mid-century stylings and a concise contemporary American menu. The large patio is host to creative craft cocktails made with the likes of seasonal produce and sea beans, bamboo, Middlebar pickle brine and saffron bitters. 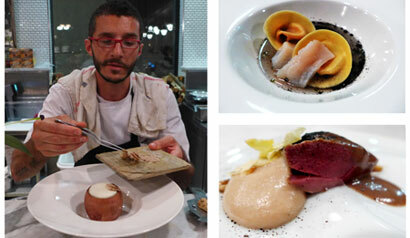 To eat, look for fresh oysters, octopus with turnip mash, beets with burrata, and agnolotti with poblano and oxtail. Dinner nightly. Ysabel, 945 N. Fairfax Ave., West Hollywood, CA 90046, 323-366-2940. 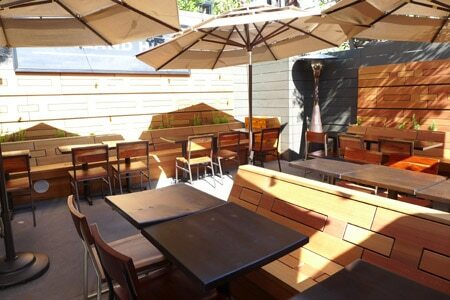 Ashland Hill has supplanted the former Wildflour Pizza on Main Street in Santa Monica, with a beachy beer/wine garden that features 16 artisanal taps and select craft wines. A seasonal menu of gourmet bites and entrees includes red curry deviled eggs, kale salad, lamb and pork meatballs with confit lemon rind, Niman Ranch pork belly tacos, charred shishito mac and cheese, and a cast-iron blonde brownie. Dinner nightly, Brunch Sat.-Sun. Ashland Hill, 2807 Main St., Santa Monica, CA 90404, 310-392-3300. Clutch, a Cali-Mex barbecue restaurant, is the newest Venice spot from restaurateur Oscar Hermosillo (Venice Beach Wines, Cerveteca). Local designers Landlocd Design pay homage to the motor using décor elements like car exhaust tubing and train track tie bolts. Bringing a SoCal influence to his Mexican and Baja California roots, Hermosillo crafted the menu with his mother and chef Nikolai Trigueros (Blue Plate Taco) to offer more local produce and seafood. Featured dishes include periwinkles with salsa verde, Santa Maria tri tip, smoked duck, carne asada and different kinds of fish cooked over a wood-burning grill. Beer and wine. Clutch, 427 Lincoln Blvd., Venice, CA 90291, 310-396-8749. North Hollywood’s newly opened Idle Hour looms large on Vineland in the shape of a giant whiskey barrel (it was built as a tap room in the 1941, and has been empty for 44 years). It’s lined with plenty of wood, and features a big tree-shaded patio in back. There’s even a private party room shaped like a bulldog. The cocktail program was created by Chris Amirault (Harlowe) with fresh, housemade twists on American classics. Expect two dozen beers on tap. To eat, find the likes of steak frites, fish and chips, pulled pork sliders, mac and cheese and bourbon-braised sloppy Joe. Idle Hour, 4824 Vineland Ave., North Hollywood, CA 91601, 818-980-5600. Chef Tin Vuong’s modern American steakhouse in downtown Hermosa Beach, Steak & Whisky, is now open. The restaurant is set in a 1920's historic brick building. Expect steakhouse classics ranging from a Prime, dry-aged rib eye and A5 Japanese Miyazaki Wagyu to Kurobuta pork short rib and roasted duck breast. Other luxe bites include a “croque caviar” with smoked salmon and crème fraiche. Find 200-plus wines on a list that features many Napa Valley & Bordeaux options; approximately 12 wines at a time rotate on the Coravin system. The bar also offers more than 80 whiskies and handcrafted cocktails. Dinner nightly. Steak & Whisky, 117 Pier Ave., Hermosa Beach, CA 90254, 310-318-5555 . One of L.A’s longtime favorite burger joints is back. Cassell’s Hamburgers has reopened at the newly restored Hotel Normandie, just a few blocks from its original location. Al Cassell’s original 1948 burger is paid homage by chef Christian Page (formerly of Short Order), whose “cross-fire” burger is made from house-ground, grass-fed Colorado angus chuck and served with Thousand Island dressing, lettuce, tomato, onions and pickles on a Parker House bun. Also expect breakfasts, sandwiches, traditional sides of potato salad and cole slaw, and house-made sodas and shakes. Breakfast, Lunch & Dinner daily. 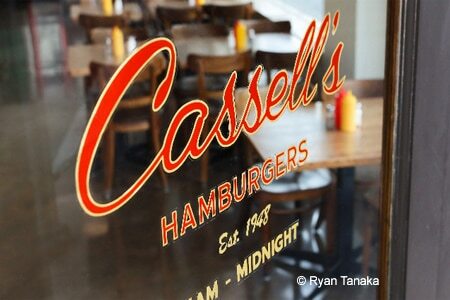 Cassell’s Hamburgers, Hotel Normandie, 3600 W. 6th St., Los Angeles, CA 90020, 213-387-5022. Lobsta Shack, the brick-and-mortar spinoff of the ever-popular Lobsta Truck, is now officially open in Chinatown on Cesar Chavez at Grand Avenue. Expect the iconic New England lobster roll with hot drawn butter (served with fries), but also an expanded menu featuring the likes of lobster mac and cheese, lobster spaghetti, and whole steamed lobster. Landlubbers can find rib eye steak and Cajun Andouille sausage. To drink, there’s fresh-squeezed strawberry lemonade or root soda. Lunch & Dinner daily. Lobsta Shack, 701 W Cesar E. Chavez Ave., Los Angeles, CA 90012, 323-999-1797. Rooftop supper club E.P. & L.P. (“extended play” and “long play”) has opened on the corner of Melrose and La Cienega. Australian chef Louis Tikaram calls up his Fijian, Chinese and Indian roots at this self-styled “Asian eating house” with dishes like grilled short rib with ginger and coriander root, Fijian ceviche with cilantro and coconut, and traditional Fijian lovo --- meat and vegetables wrapped in banana leaves and steamed in a pit of hot rocks. Designed by Projects of Imagination, the eatery is on the first floor, while the 4,000-square-foot rooftop lounge hosts several bars. E.P. & L.P., 603 N. La Cienega Blvd., West Hollywood, CA 90069, 310-855-9955.
, 3536 W. Sunset Blvd., Los Angeles, CA 90026, 323-741-8300. The team behind Los Feliz’s popular Bar Covell has opened their newest wine-centric concept, Augustine, in Sherman Oaks. Augustine offers 75 wines by the glass, ranging in price from $10-$100, and bottles ranging from $100-$1000. The selection includes rarities such as an 1874 Chateau Lafite and a 1934 Chateau Margaux. A selection of rare bottled beers, along with six varieties on tap, are also available. Chef Evan Algorri’s (Bouley, Union Square Café) opening menu features braised octopus, root vegetable Caesar salad, charcuterie and spiced nuts. Dinner nightly. Augustine, 13456 Ventura Blvd., Sherman Oaks, CA 91423, 818-990-0938. Southern California’s Brouwerij West will open its craft brewery in early 2016. It will be located in San Pedro inside a wood truss-roofed warehouse that was originally built by the U.S. Navy in the 1940s, now part of the CRAFTED arts complex. 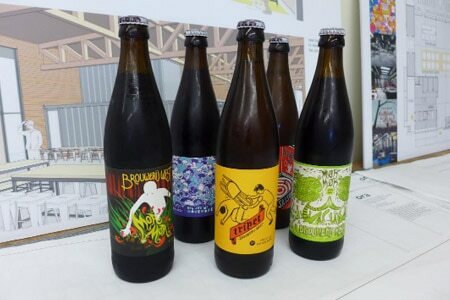 This will house the beer production, as well as a restaurant with seating for more than 200 people, a bottle shop, a coffee bar, a retail outlet and large private event space. Brouwerij West, Warehouse No. 9, 110 East 22nd St., San Pedro, CA 90731, no phone. Chef Ray Garcia (B.S. Taqueria) is teaming up with restaurateur Bill Chait on Broken Spanish, located in the former Rivera space in downtown Los Angeles. Garcia was the 2014 “King of Porc” (the winner of the Grand Cochon competition at the Food & Wine Classic in Aspen) so pork will likely play a prominent part on the menu. Broken Spanish, Met Lofts, 1050 S. Flower St., Los Angeles, CA 90015, 213-749-1460. Silver Lake’s savvy new spot for Kansas City barbecue, small-batch bourbons and craft beers is Charcoal BBQ, on Hyperion Avenue. Chef Jeremy Zimmerman (Sunset Marquis) has imported a 1,700-pound smoker to cook up the likes of ribs and dry-rubbed brisket. He also fashions barbecued pork loin into a banh mi with smoked cola aïoli, and serves a pulled pork sandwich with greens and a fried egg. The bourbon program (with a list of more than 80 brown liquors) specializes in small batches spanning 13 states, including Breckenridge (Colorado) and Angel's Envy (Kentucky). The beer list focuses on Belgian ales, and mixologist Tavis Chavez (EVELEIGH, FIG) offers an enticing cocktail list. Dinner nightly. Charcoal BBQ, 2611 N. Hyperion Ave., Los Angeles, CA 90027, 323-300-5500. Chef Akasha Richmond (Akasha) has taken over the former Ford’s Filling Station space in Culver City and plans to open a modern Cal-Indian restaurant, called Sāmbār. Sāmbār, 9531 Culver Blvd., Culver City, CA 90232, no phone. The Independence, a modern tavern, has opened in Santa Monica’s former Buddha’s Belly space. The neighborhood restaurant and bar features market-driven food and cocktails. The Independence, 205 Broadway Ave., Santa Monica, CA 90401, 310-458-2500. 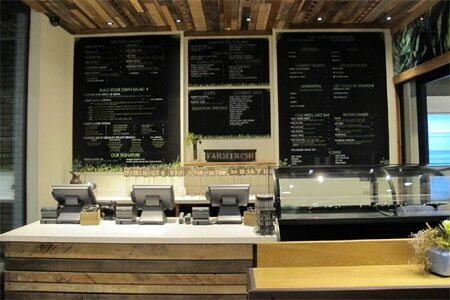 Greenleaf Gourmet Chopshop has opened a new location in Hollywood. This salad-centric spot features a full bar along with reclaimed wood among the décor and a patio with heat lamps and a fire pit. Greenleaf Gourmet Chopshop, 6201 Hollywood Blvd., Ste. 120, Los Angeles, CA 90028, 323-380-5127. Mid-Wishire’s former El Toro has become Spare Tire Kitchen & Tavern, a gastropub featuring more than 120 whiskies, and a menu of small plates, gourmet pizzas and refined pub fare. Chef Gavin Mills (Wood & Vine) dishes up charcuterie (duck and cherry pâté, Finnocchio fennel sausage), Brie tartine, braised short rib gnocci, New Zealand lamb chops, steamed mussels and garlic prawns. Also, find wood-fired pizzas with toppings ranging from roasted pork belly to Brussels sprouts and fresno chilies. Lunch & Dinner daily. Spare Tire Kitchen & Tavern, 5364 Wilshire Blvd., Los Angeles, CA 90036, 323-525-2615. ., West Hollywood, CA 90069, 310-855-7285. NorCal’s family-owned Kinder's BBQ has launched its first Southern California eatery at STAPLES Center. Kinder’s Smokehouse BBQ is located on the City View Terrace, (next to section 325.) The menu features the restaurant’s famous ball tip sandwich, specialty hand-chopped sandwiches, barbecue brisket, barbecue pork shoulder, rotisserie chicken and sides like slow-smoked beans, honey cheddar cornbread and horseradish slaw. Mark Peel (Campanile, The Tar Pit) will open his “fast-serve” fish stand restaurant, Bombo, downtown at the Grand Central Market this March. Expect roughly 10 gourmet fish dishes that can be cooked in under four minutes, including seared Spanish mackerel on rice, mussels in curried cream, and lobster bouillabaisse, alongside seasonal salads. Bombo, Grand Central Market, 317 S. Broadway, Los Angeles, CA 90013, no phone. A posh stretch of Melrose in West Hollywood will soon be home to Le Relais De l’Entrecôte, a franchise of the Parisian chain (including Geneva and Dubai) devoted to a single menu item --- steak frites --- along with French wine and desserts. Décor will follow the Paris flagship, with wooden bistro chairs, art posters and tiled floors, and there will be outdoor seating, too. Le Relais De l’Entrecôte, 8755 Melrose Ave., West Hollywood, CA 90069, no phone. Hannah An (Crustacean) has opened The District by Hannah An in the former Duplex space. Expect chic French colonial décor and a Vietnamese menu accented by Californian, French and Japanese flavors. 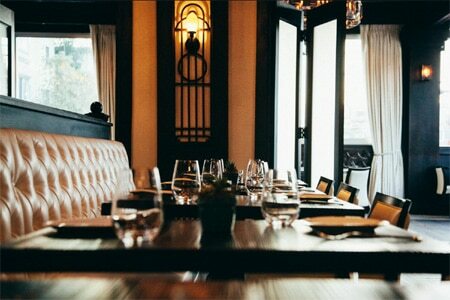 The District by Hannah An, 8722 W. 3rd St.
, Los Angeles, CA 90048, 310-278-2345 . Simmzy's has opened a location in Burbank. The restaurant offers a casual menu of gastropub fare along with two dozen rotating craft beers on tap. Simmzy's, 3000 W. Olive Ave., Burbank, CA 91505, 818-962-2500. Roy Choi has updated his restaurant A-Frame with a new chef, Johnny Yoo (Melisse, Drago Centro), vintage Hawaiian décor, and a revamped menu. The food offerings are heavy on Hawaiian twists like taro hush puppies, poke, chili rice cakes with cheddar and pineapple, and a "Loco Moco" hamburger steak with a sunny side up egg and Japanese curry. New cocktails include the "Zombie Isle," made with fancy rums, lime, apricot and absinthe. A-Frame, 12565 Washington Blvd., Los Angeles, CA 90066, 310-398-7700. Chef Walter el Nagar is bringing his "New Wave Italian" cuisine to Flake in Venice for the 7th installment of his Barbershop Ristorante pop-up. The five-course meal ($85, exclusive of tax and service charges) will feature unique dishes like a “sea bonbon” with white chocolate, sea urchin and raspberry. Reservations are required. For more information, visit www.barbershop-ristorante.com. Barbershop Ristorante, 513 Rose Ave., Venice, CA 90291, 424-272-5849. 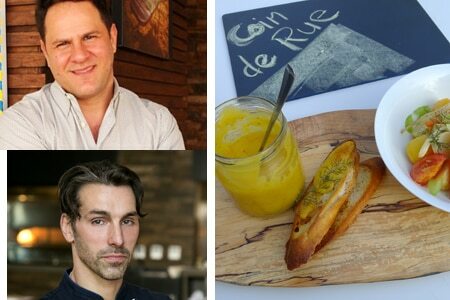 Executive chef David Féau (The Royce) has partnered with Adam Fleischman on Coin de Rue, a Parisian-style bistro pop-up, located in the former Red Medicine space. Prix-fixe menu items include cabbage and sea urchin soft scrambled eggs, turmeric crab bisque, monkfish Bouillabaisse, roasted duck Apicius and apple tart Tatin. Additional bar bites are available, such as rabbit terrine and caramel peppercorn puff with chicken liver foie gras mousse. The prix-fixe menu is priced at $55 for four courses, with a supplemental bar bites menu available a la carte. Wine pairings are available for an additional $25. Classic cocktails by mixologist Cody Summer (The Varnish, Seven Grand) are also available throughout the night for $12 each. Coin de Rue's dates are February 12-14, February 19-21 and February 26-28, 2015. Each night, the first seating is at 6 p.m., with the final seating at 9:30 p.m. For reservations, call 310-943-9650. A credit card payment will be collected at the time of booking to confirm. Coin de Rue, 8400 Wilshire Blvd., Beverly Hills, CA 90211, 310-943-9650. Kevin Kathman (The French Laundry) now governs the menus as executive chef at The Larchmont. He's presenting California-inspired menus influenced by European and Asian flavors. The Larchmont, 5750 Melrose Ave., Los Angeles, CA 90038, 323-464-4277. Gordon Ramsay at the London West Hollywood has officially closed due to the end of contractual agreements between Ramsay’s company and the hotel. The restaurant remains open, and is now renamed Boxwood. Chef Anthony Keene is still in charge the kitchen, and the menu remains the same for the moment. Gordon Ramsay at the London West Hollywood, The London West Hollywood, 1020 N. San Vicente Blvd., West Hollywood, CA 90069, no phone. Santa Monica’s seasonal pioneer, JiRaffe, closed after Valentine’s Day 2015. Owner Raphael Lunetta opened the restaurant with Josiah Citrin (Mélisse) 18 years ago. JiRaffe, 502 Santa Monica Blvd., Santa Monica, CA 90401, no phone.